To edit an existing polygon in the view, you have to first enable picking mode. Alternatively, right click within the polygon in the view and select Pick "Polygon". To exit the picking mode, click the Pick polygon pencil icon. Alternatively, double-click or press Esc to disable polygon picking. 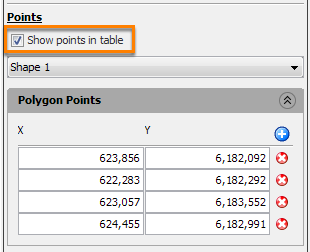 In addition to editing the polygon directly in the view, add/edit/delete the points in the Points section in the Details Panel by clicking on the Show points in table check box. Note: This section will only be available once you have placed at least one point. This section will NOT be available if the polygon has too many points. If you have multiple shapes, select the polygon shape that you wish to edit. To add a new point to the shape, click the Add Row icon in the Polygon Points section. Type the coordinates of the point in the blank row. To delete an existing point, click the Remove Row icon. To edit an existing point, change the coordinates in the particular row. Note: When a polygon is created on a time/depth slice in map view, the Z dimension (vertical dimension) will be shown as TWT or TVDSS based on the volume data. The time/depth marker is also shown in the Details Panel. This can be modified to move the polygon closer to or further away from the surface. 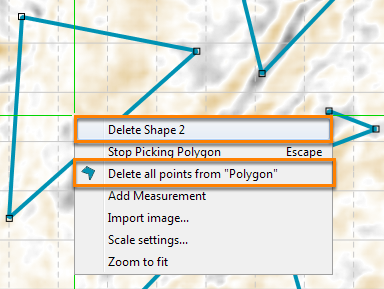 While in picking mode, right-click within the polygon and click Delete Shape to delete the selected shape, or click Delete all points from "Polygon" to delete all the polygon shapes and points.